Toko Jual eBook Reader Kindle 7th gen.
Amazon announced the launch of 7th generation Kindle ebook reader in September. The new entry-level Kindle comes with increased internal storage and a touchscreen display, which means the entire Kindle lineup is now touch-only and devoid of the 5-way controller seen in earlier models. We reviewed the Kindle Paperwhite earlier this year, and with the addition of a touch screen, the all-new Kindle is pretty much identical in terms of how you navigate across the device, and the software features it offers. If you've never bought or used a Kindle touchscreen device before, we suggest you read that review before continuing. Go on, we'll wait as you do that. Now that you are all caught up, let's talk about the differences between the Kindle and the Kindle Paperwhite. 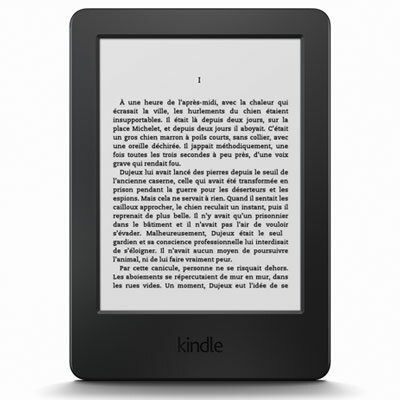 Kindle ebook readers use an E Ink display that differs from conventional LCD and LED displays you see in the likes of mobiles and tablets. LCD and LED displays emit light, which means you'll have no problem viewing them in the dark, but electronic paper displays (like E Ink) reflect light, just like conventional paper. Without the need of a backlight, devices with electronic paper displays can have longer battery life - one of the biggest reasons why your ebook reader's battery life is measured in weeks, while your phone can barely get through a working day. Electronic paper displays are also easier on the eye, since you don't have to deal with the constant strain of a backlight. This makes it easier to stare at the screen for longer durations, but without a backlight, it's impossible to read in a dark room. Kindle Paperwhite ebook readers solved this by including a built-in light, giving you the metaphorical best of both worlds. The new basic Kindle, just like its predecessor, comes without the built-in light, which means if you like doing a bit of reading before going to sleep, you'll need to make sure you have a bedside light or any other source of lighting in the room. Alternatively, you could buy a cover with a built-in light. The 7th generation Kindle comes with 4GB storage, twice as much as the previous one, which means you can hoard more books. However, it's slightly heavier and bulkier than its predecessor. While some may miss the physical buttons for navigation and turning pages, we like the ability to just tap on screen and switch pages. Connectivity on the entry-level Kindle is limited to Wi-Fi. Like other members of the Kindle ebook readers family, you get weeks of battery life, so that is never a problem. In terms of UI and software features, the experience is very similar to the Kindle Paperwhite - you did read the review, right? A forthcoming software update will add a few more features - details can be found on the Amazon website. The Kindle remains the best ebook service in India in our opinion, and we hope the Amazon Kindle Unlimited subscription service is launched in the country soon with a big enough selection.